Originally a grass seed and crimson clover farm, Winter’s Hill Estate has been crafting Pinots (Noir, Blanc, and Gris) as well as Rosés and blended wines since it converted into a vineyard in 1990. They began producing wine in 1998, building their own winery in 2009. 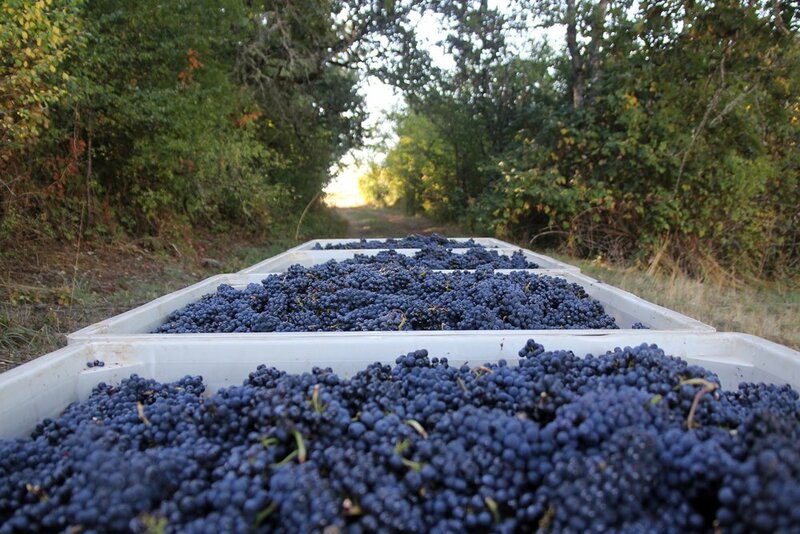 They produce between 3,000 and 4,000 cases of wine each year, which are sold in their tasting room, wine club, and throughout Oregon and the Northwest. Part of their 100 acres is also devoted to native plants, oak savanna, and pollinator habitats to support butterflies and bees. WHAT ARE THEY DOING FOR BEES? Even though grapes are a wind-pollinated crop, the Gladharts decided early on to make sure that their land was friendly to pollinating insects. “I don’t know much about bees, but I’m quite aware that we’re dependent upon them,” says Emily. Originally, they created pollinator habitat to accommodate butterflies, and later added more native plants for the bees after hearing about the Oregon Bee Project. “What’s good for butterflies is good for bees,” says Emily as she tours guests through some milkweed. Other native habitat plants they grow include Oregon grape, pearly everlasting, Kinnikinnick, Douglas aster, Ceanothus known as California lilac, Oregon iris, trillium, Western bleeding heart, native honeysuckle amongst others. Beyond the pollinator habitats, Winters Hill supports the Oregon Bee Project by being a bee collection site for the Oregon Bee Atlas, which is trying to map out Oregon’s estimated 500 different species of bee. “Well, I’ve always liked bumblebees,” says Emily. “I didn’t realize there were so many varieties!” The whole family now looks at all plants differently. In the end, Winters Hill came to be a Flagship Farm not because supporting pollinators supported their crops – simply because the Gladharts wanted to help. “It just sounded exciting,” Emily says. And it is! Part of the Winter Hill Estate devoted to pollinator habitat. Emily and Peter Gladhart have been running Winters Hill since 1990, having taken over for Emily’s parents, who bought the land in 1961. Due to the property size and the soil quality, Emily and Peter decided to convert the grass seed and crimson clover farm into a vineyard. “Emily’s parents picked the perfect place to plant grapes in 1961,” says Peter. “And they had no idea,” adds Emily. Neither Emily nor Peter came into the winery business with grape growing experience, and they have had to learn through trial and error over the years. Still, through persistence and passion, Winters Hill has grown significantly since 1990: Russell Gladhart, Emily and Peter’s son, is now a partner and Winemaker, and their wines have won a variety of awards, which are displayed on a huge bulletin board full of ribbons and medals in their tasting room.